Put those broken shards of terra cotta pots or clay saucers to good use in a Halloween recycling craft that transforms styrofoam balls into beautifully textured mosaic pumpkins. This project typically takes two to four hours to complete. 1. Wax serrated knife with candle stub or paraffin. Cut thin slice from bottom of foam ball. Mark center bottom and center top of ball. Use marker to divide ball into six equal vertical segments. To make this easier, wrap three large rubber bands around ball before marking. 2. Use knife to cut 1/2″- to 1″-deep V-shaped groove along each segment line. Smooth cut edges with backside of metal spoon. Carve small hole in center top for stem; insert dowel to check fit and set aside. 3. To prepare mosaic pieces, place terra cotta items, one at a time, inside old towel. Use hammer to break items into 1″ to 1-1/2″ pieces; do not pulverize. Remove smaller pieces periodically to check size. Continue until you have approximately 6 c. of mosaic pieces. 4. 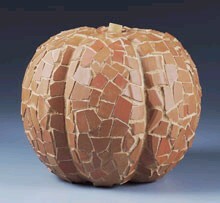 Use palette knife to spread 1/8″-thick layer of tile adhesive onto small section of foam pumpkin. Press terra cotta pieces firmly into adhesive, leaving roughly equal amount of space between pieces. Use curved terra cotta pieces on more rounded parts of pumpkin where possible; do not cover stem hole. Repeat to cover pumpkin; let dry. Glue stem into hole. 5. Follow manufacturer’s instructions to mix grout, unless using pre-mixed grout. If desired, tint grout with small amount of acrylic paint in disposable bowl; mix well. 6. Wearing gloves, spread grout onto pumpkin, working it into spaces between terra cotta pieces. Use spatula to scrape off excess and to reapply where needed. 7. Use soft, damp sponge to clean mosaic surface after grouting. Rinse tools and sponge in bucket of water rather than household sink; discard water outdoors. 8. Use soft rag to clean face of terra cotta one last time; set aside to dry completely. Project reprinted courtesy of The Dow Chemical Company, Manufacturer of Genuine STYROFOAM(R) Brand Foam.